Michael tweeted this morning that Girl Meets World was nominated for the third year in a row for an Emmy. I assume the same category as last year! Congratulations to the cast, crew and writers for the Emmy nomination and an amazing 3 year run. We miss the show so much! Season 4 would've shown that what drew Farkle, Lucas and Zay to Riley and Maya was the deep friendship and respect they had for each other. must be at the center of it. Cory and Topanga always knew that. So, as you all meet this world, we wish you friendship, respect and love. Oh, and Auggie and Ava were forever. New Interview with Michael Jacobs and his son Joshua Jacobs! Michael Jacobs and his son Joshua were interviewed by “Written By” magazine! It is a wonderful interview. I really enjoyed reading it. They both talk about writing Girl Meets Commonism the episode in Season 2. The idea for the episode was actually Josh’s idea and he came up with it from personal experience which led to him and Michael writing it together. Go here to read the interview it is a great read! The interview starts on Page 26 and goes until Page 31. “Would you still approach it as the last season? The fan support was immediate with campaigns targeted at places like Netflix and Hulu. Does that help? I think there’s no question that the fan reaction to this is noticed. I think what is astounding is the places the fans have picked out for us are incredibly astute. I think in terms of not only what the show is, and what they want it to become, they have picked out those places accordingly. I should say the reason “Girl Meets World” — People always ask me, ‘Why did you go to Disney Channel?’ The original was on ABC. You dance with who brung ya. Disney Channel asked if we were interested in continuing the story. We put it there because that’s where the invitation came from. I think they were excited about seeing what happened to these characters. Within the parameters of the people that invited us, we created an executed a show for that audience. 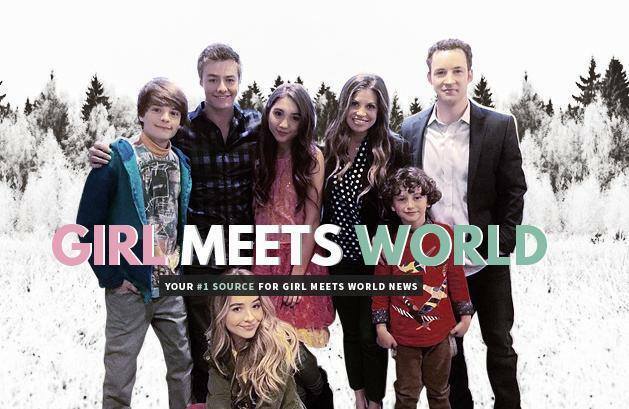 When it was announced, the old “Boy Meets World” fanbase was very excited about coming to this. The immediate realization was that we would not be able to do the exact same tonality we had originally done. And we knew that that might be off-putting to expectations. However… Whether it was Cory Matthews or Riley Matthews, nothing’s changed as to how a young person grows up. But let me say that, the difference between “Boy Meets World” and “Girl Meets World,” if you examine the first three seasons of the two shows, what we attacked in those first 3 seasons are at least comparable in severity of stories to “Boy” and had we been allowed to continue — we were pushing down all kinds of walls at Disney, I don’t think they expected or had really ever seen — we would have kept going. But it becomes problematic because I think the mandate of that network is younger kids. If you examine what happened, it’s OK, no harm, no foul, we simply outgrew that venue. That’s why I perceive there might be interest somewhere else, because of the types of stories we could tell. I’m not intimating or suggesting we would go absolutely crazy with license to tell extreme and severe stories. I would, however, love to continue the reality of what happens to these characters as they grow up in this world.